BACKGROUND AND PURPOSE: Subpial cerebral arteriovenous malformations (AVMs) can develop a transdural arterial blood supply. The relationships between AVM volume, patient age, embolization and prior hemorrhage, and the frequency of transdural blood supply were investigated. 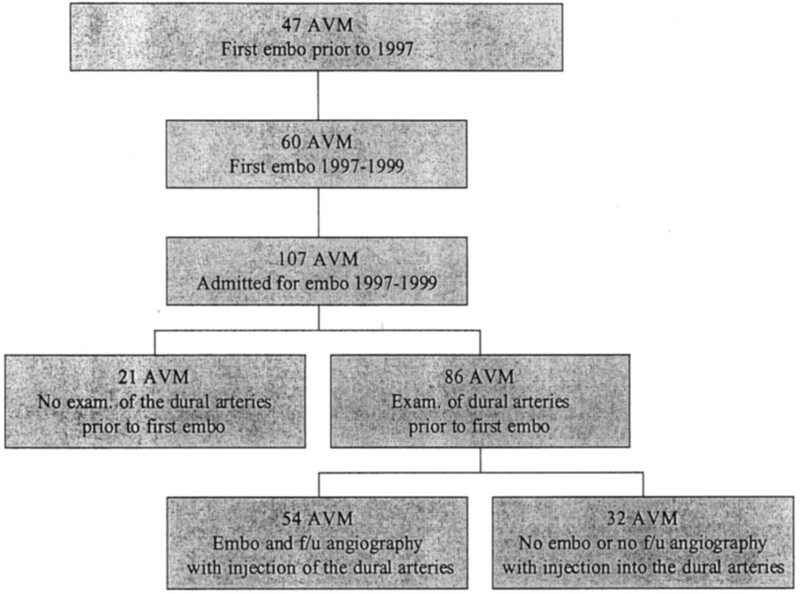 METHODS: During 1997–1999, 105 consecutive patients with 107 AVMs adjacent to the dura mater were treated with embolization at one center. One of the authors, who was not directly involved in the treatment, retrospectively reviewed the angiograms. Patient histories were collected from hospital records. RESULTS: Angiograms obtained before the first embolization included a selective injection into the dural arteries in 86 (80%) AVMs. Thirty-six (42%) of those had transdural blood supply. The frequency increased with AVM volume and patient age but not with intracranial hemorrhage. Follow-up angiograms obtained subsequent to at least one embolization were available in 32 patients who had no transdural blood supply at the first examination. In eight (25%) patients, a transdural blood supply developed during a mean treatment time of 12 months. CONCLUSION: A transdural blood supply is common in AVMs adjacent to the dura mater. The frequency increases with AVM volume and patient age. Intracranial hemorrhage does not seem to be a predisposing event. Transarterial embolization appears to induce factors that promote the development of a transdural blood supply. A cerebral arteriovenous malformation (AVM) may, despite being subpial in nature, receive part of its blood supply through transdural arteries (1–3). Blood flow can be rerouted as part of the natural course of the disease, and this change may be present when the lesion is discovered or may emerge later. Intracranial hemorrhage and local ischemia, either spontaneous or induced by surgery or embolization, have been proposed as trigger factors (2, 4). This investigation was prompted by the clinical observation that a transdural blood supply (TBS) to an AVM is sometimes overlooked and that this oversight may sometimes lead to erroneous decisions. Thus, an endovascular treatment may begin despite the responsible physician having insufficient knowledge of the extent and angioarchitecture of the AVM. On other occasions, one can have the false impression that the volume of an AVM has been significantly reduced with embolization when the pial blood supply to the AVM has been overtaken by dural arteries, and the nidus remains largely unchanged. For the same reasons, a radiosurgical team may treat patients with larger than anticipated AVMs, and thus, have an unfavorable cure-to-complication ratio. Conversely, only that part of the AVM with a pial blood supply may be irradiated, and the part of the lesion supplied from dural branches may unintentionally be left untreated, unless the entire lesion is clearly depicted on the adjunct stereotactic MR images. Thus, better knowledge of the nature of a TBS can improve AVM treatment. The objectives of the study were to determine the frequency of a TBS in pial AVMs before embolization and to assess the effects of patient age and AVM volume. We also tested the hypotheses that hemorrhage or transarterial embolization with n-butyl-2-cyanoacrylate (NBCA) can induce TBS. During 1997–1999, 105 consecutive patients with 107 AVMs adjacent to the dura mater were admitted for treatment by means of embolization. In this article, the cases are regarded as occurring in 107 separate patients. Sixty of the 107 patients were admitted for their first endovascular treatment in 1997–1999. The other 47 patients had been treated by means of embolization for the first time before 1997 and were admitted for additional embolization during the study period. In all 107 patients, angiograms had been obtained before the first endovascular treatment. Subsequent angiographic examinations were either follow-up examinations performed after approximately 6 months, or they were part of the endovascular treatments and were therefore individualized. The second angiographic examination was usually performed 3–6 months after the first, and subsequent examinations were performed at longer intervals. One of the authors (M.S. ), who was not directly involved in the treatments, retrospectively reviewed the primary angiogram obtained before any endovascular procedure and the last angiogram obtained during the study period. The reviewer was blinded to the patients’ medical histories. In 86 patients (80%), the examination performed before the first treatment with NBCA included a selective injection of contrast medium into the external carotid artery or the vertebral artery that supplied the dural surface adjacent to the lesion. The presence or absence of a TBS to the AVM was noted. Thereafter, 54 (63%) of these patients underwent at least one embolization procedure with NBCA. In addition, on a later occasion, they underwent angiography with the selective investigation of the arteries supplying the dura mater. Again, the presence of a TBS to the AVM was noted. The remaining 32 (37%) patients had not been treated with embolization, or they did not have adequate follow-up angiograms (Fig 1). Distribution of the 107 patients with AVMs adjacent to the dura mater who were admitted for treatment with embolization in 1997–1999. AVM nidus volumes before and after embolization were determined from the angiograms by using the intersecting cone method (5). In all angiographic examinations performed with known x-ray geometry, the AVM nidi were delineated in the same way as before gamma-knife radiosurgery (6). The AVM volumes were calculated from the intersection of the orthogonal x-ray cones defined by the delineations. For AVMs with a volume less than 10 mL, the intersecting cone method is an acceptable substitute for volume data derivation from the dose planning process before gamma-knife radiosurgery; that is, volume measurements with the best-fit isodose method (7, 8). Fourteen cases treated for the first time before 1997 were excluded from the volume measurements because of unknown geometry in the x-ray equipment or missing radiographs. The NBCA injections were targeted against the arteriovenous shunt itself or against weak vascular structures in the nidus (9). The main functional aim was protection against hemorrhage. A secondary morphologic aim was obliteration of the nidus. All forms of nidus cast were present in the series, but embolization of the feeder proximal to the nidus was uncommon. A total of 312 NBCA injections were performed during 134 procedures. Information about intracranial surgery or hemorrhage was collected from the patients’ records. The relationship between patient age and the frequency of TBS at first angiography was tested by comparing the sample means at the P < .1 level and with logistic regression for which P < .1 indicated a significant difference. The relationship between intracranial hemorrhage and the frequency of TBS at first angiography was tested as a single variable with the Π2 test (10%level, one degree of freedom) and also in a multiple variable analysis with logistic regression for which P < .1 indicated a significant difference. The relationship between AVM volume and the frequency of TBS at first angiography was tested by comparing the sample means on the P < .01 level and with logistic regression for which P < .01 indicated a significant difference. The relationship between intracranial hemorrhage before first angiography, and AVM volume was tested with logistic regression for which P < .05 indicated a significant difference. Eighty-six patients with TBS comprised 35 female and 51 male subjects. The distribution of the material according to location, Spetzler-Martin grade, and blood supply is shown in Figure 2 and Figure 3. Distribution of TBS, patient age, AVM volume, previous intracranial hemorrhage, and previous intracranial surgery is shown in the(Table). Lobar distribution of the 86 AVMs in the study. Each group is divided according to the presence of a TBS before embolization. 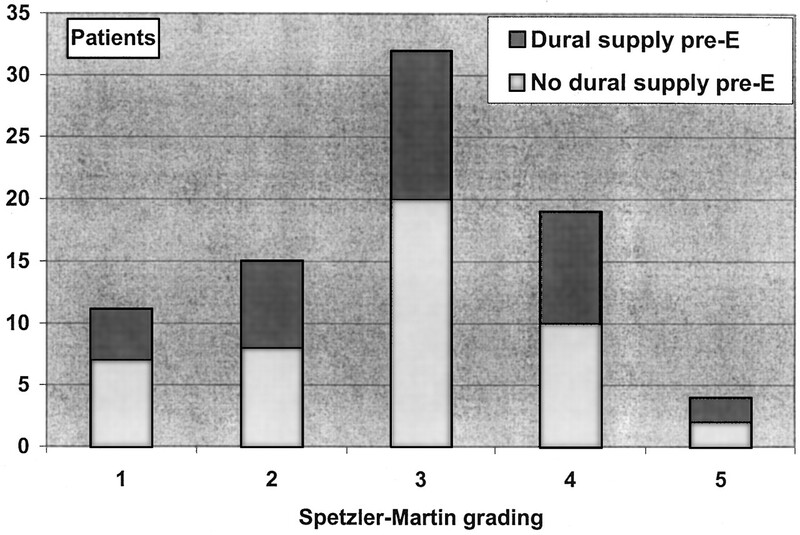 The distribution of the 81 AVMs in this study, according to the Spetzler-Martin grades. Five patients were omitted because of missing angiograms (posteroanterior) views from the first examination). Each group is divided according to the presence of a TBS before embolization. The frequency of TBS at first angiography increased with increasing patient age (P < .1. In the 72 (84%) patients in whom AVM volume data from before embolization were available, increasing AVM volume was related to the presence of a TBS (P < .01). Six patients had undergone intracranial surgery (the evacuation of a hematoma or drainage creation) before initial angiography. A history of intracranial hemorrhage was related to the absence of a TBS when it was analyzed as a single variable (10%level), but it was not so related in the multivariate analysis (P < .1). 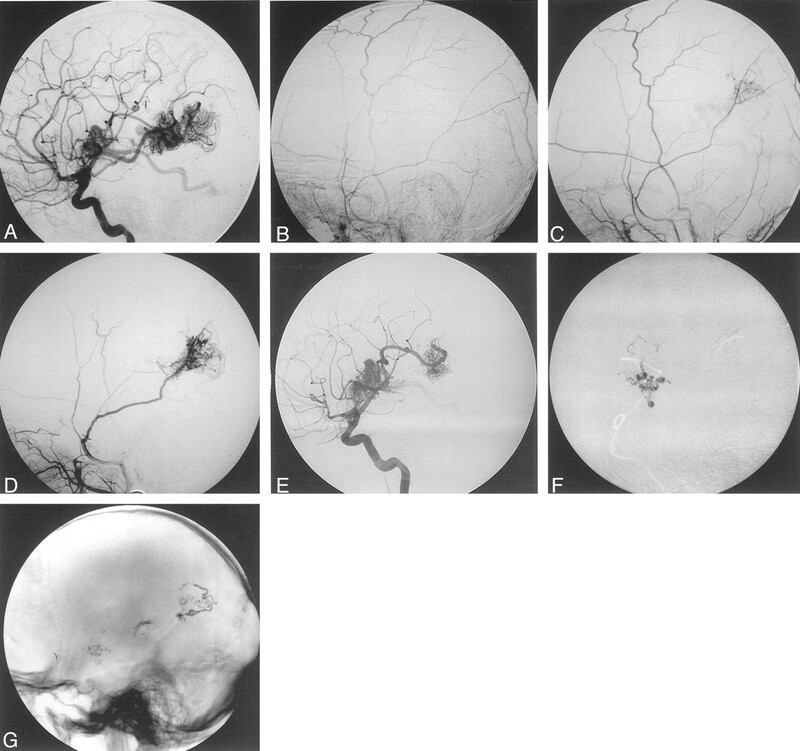 Fifty-four patients underwent embolization during 1997–1999 and follow-up angiography. The mean reduction in nidal volume with embolization was 48%during a mean management time of 18 months. At the end of the 3-year study period, 12 (22%) of the 54 patients were scheduled for further embolization or control angiography. Thirty-two (59%) patients had been referred for adjunct radiosurgery, and one patient underwent surgery. Nine (17%) of the 54 patients were cured or had lesions that the managing team considered untreatable because of angioarchitecture, location, or volume. Thirty-two patients belonged to a particular cohort (Fig 4). They all had normal angiographic findings in the dural arteries before any embolization procedure. In addition, all underwent follow-up angiography after one or several embolization procedures that included injection of contrast material into the arteries supplying the dura mater covering the AVM. In eight (25%) of these patients, a TBS to the AVM developed during a mean time span of 12 months. Sixteen of the 32 patients had a history of intracranial hemorrhage before embolization; in two of these, a TBS developed during the study period. TBS was shown to develop 3 months after partial embolization. None of the patients had an intracranial hemorrhage after the first treatment with embolization. Lobar distribution of the 32 patients who initially had no transdural supply to the AVM and who then underwent at least one embolization procedure with follow-up angiography. Each group is divided according to the presence of a TBS at the end of the mean treatment time of 12 months. Reports of the prevalence of a TBS to pial AVM are scarce. Newton and Cronquist (3) were the first to systematically study the phenomenon, and they noted a meningeal supply to a pial AVM in 27% of their cases. However, the external carotid artery system could be evaluated in only 91 of their 129 patients. In addition, 15 of the AVMs included in their series had only a TBS; thus, the AVMs probably constituted dural arteriovenous fistulas (DAVFs), which are now known to be entities distinct from AVMs. Nevertheless, the 15 patients with a probable DAVF must have undergone angiography in which the branches of the external carotid artery were visible. Thus, in Newton and Cronquist’s study, an evaluation of the external carotid system was possible in 76 of the 114 patients with a mixed pial-dural or purely pial AVM. TBS to a pial AVM was noted in 20 (26%) of the 76 cases. Willinsky et al (2) found a TBS in 34 (29%) of their 114 patients. However, their report is not clear about the number of patients who had been examined with a selective injection into the external carotid artery system. More recently, Miyachi et al (1) evaluated the angiograms of 52 patients with pial AVMs, including those obtained with a selective injection into the internal and external carotid arteries. They found that 65%of the superficially located AVM had a TBS. Possible therapy before the angiographic study was not accounted for in any of the reports. In our study, 47%of the patients had a TBS before embolization. 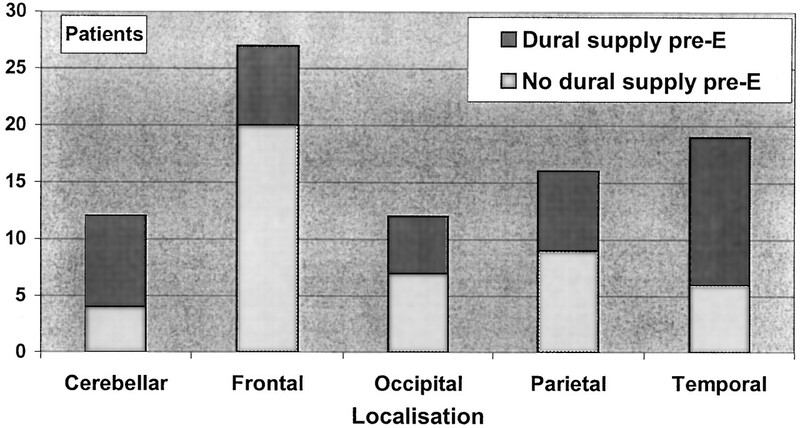 The relative frequency was somewhat lower for frontal AVMs and a little higher for those in the temporal lobes or the posterior fossa (Fig 2); this finding is in accordance with earlier observations (1, 4). The range of observed TBS frequencies in the reports might be due to variations in angiographic technique or patient selection, or they may simply be due to chance. Miyachi et al (1) reported a higher relative frequency of large AVMs than ours, and they found that larger AVMs had a higher rate of having a TBS. In our study, a strong relationship between increasing AVM volume and the rate of TBS was noted. In 14 (16%) of our 86 patients, no volume data were available. All 14 cases had been treated for the first time before 1997, and therefore, the exclusion of these patients could have introduced a bias. However, these patients mostly had large AVMs and had undergone several embolization procedures. Therefore, the exclusion would have negative impact on the observed relationship between AVM volume and TBS only if almost all of the 14 patients did not have a TBS; this situation is unlikely. Our finding that the frequency of TBS increases with patient age is also in accordance with findings from an earlier study (1). Six patients had undergone a hematoma evacuation or drainage creation procedure before embolization. The small number of cases and the variety of surgical procedures made statistical analysis meaningless. However, the trend was that surgery did not increase the risk of developing a TBS (Table). Intracranial hemorrhage was related to the absence of a TBS if it was analyzed as a single independent variable but not if it was analyzed in a logistic regression in which AVM volume and patient age were the other independent variables. The reason for this difference might be that a small AVM often has no way other than hemorrhage with which to express itself, and therefore, it is concealed until the patient bleeds. A large AVM more often causes an event other than hemorrhage, despite the fact that the annual risk for hemorrhage increases with the volume of the AVM (10). The covariation between a TBS, a presentation involving hemorrhage, and AVM volume is the confounding factor that could be eliminated in the logistic regression. Despite the low P value (P < .1), no relationship between hemorrhage and the development of a TBS was observed; this finding makes such a causal relationship unlikely. TBS developed in 25%of the 32 patients who had an angiogram with no TBS before treatment and who subsequently underwent embolization. The mean time between the first embolization procedure and follow-up angiography was 12 months. Is this finding compatible with the natural course of the disease? Most probably, the AVM had not been present from birth, at least not in a mature form, and it evolved later in life (11, 12). However, the emergence of a new AVM in adults is exceedingly rare, and in addition, data from studies of the risk of AVM hemorrhage (10, 13–15) are hardly compatible with AVM development in adults. Therefore, the AVM probably develops in some fashion during childhood or adolescence, and in most patients, it has been present for many years. If so, the high frequency of TBS development after embolization suggests that the natural spontaneous angiogenic activity could have been augmented by the endovascular treatment (Fig 5). Findings in a 10-year-old boy with two AVMs: one in the right frontal lobe adjacent to the sylvian fissure and one in the right parietal lobe. Before embolization, the patient had bled from the frontal AVM. All images are lateral angiograms. A, Internal carotid arterial (ICA) injection before embolization. B, External carotid arterial (ECA) injection before embolization. C, ECA injection 3 months after partial NBCA embolization of the parietal nidus. Note the emerging TBS to the parietal nidus but not to the frontal nidus. D, ECA injection 28 months after the first NBCA embolization. Note the increase in the TBS to the parietal nidus. The frontal nidus still has a purely pial blood supply. E, ICA injection 28 months after the first NBCA embolization. Note the lack of contrast-agent filling in the part of the parietal nidus over taken by the TBS. F, Embolization of the frontal nidus (after the image E was obtained). Note the intranidal filling of NBCA. G, Nonsubtracted lateral view obtained without the injection of contrast material after the last embolization procedure (performed 28 months after the first procedure). Image shows partly proximal and feeder embolization in the parietal AVM and better penetration in the anterior nidus. What is the mechanism for the development of a TBS to an AVM? A response to local angiogenic factors secondary to ischemia (16) or the effects of surgery or embolization (4) have been discussed as potential mechanisms. However, we found no systematic investigation of the phenomenon. Marti et al (17) investigated the effects of experimental middle cerebral artery occlusion on the pial vascularization in mice. Hypoxia was present in the penumbra zone around the infarction, and the tissue responded with increased expression of vascular endothelial growth factor (VEGF) and an angiogenic reaction started (17). Slevin et al (18) examined humans with acute stroke and found that the levels of VEGF in blood were elevated as long as 14 days after the ictus and suggested that this change may provide long-term beneficial effects as a result of continued angiogenesis over several months. VEGF expression is increased in patients with an AVM, particularly in children with a recurrent AVM (19, 20). Dural and pial arteries have different embryologic origins, and thus, VEGF expression or angiogenic mechanisms in the two systems do not necessarily have to be identical. Moyamoya disease, with its abundant TBS development, gives an opportunity to study the angiogenic mechanisms of the dural arterial system. TBS in moyamoya disease is believed to develop as a counterbalance to the slowly developing brain ischemia due to the progressive occlusion of the carotid siphons (21, 22). Yoshimoto et al (23) analyzed CSF from 38 patients with moyamoya disease and found no relationship between VEGF and neovascularization. However, they found that basic fibroblast growth factor (bFGF) is a useful predictor of the effectiveness of indirect revascularization after surgery (encephaloduroarteriosynangiosis). On the other hand, Kilic et al (24) recently reported elevated VEGF expression but not elevated bFGF levels in patients with an AVM. Thus, the roles of VEGF and bFGF in the development of a TBS in AVM are unclear. A prospective study of angiogenic factors released during and after the embolization of AVMs could perhaps shed more light on this issue. Many questions remain to be addressed. For example, why does TBS nourish the brain in moyamoya disease and only the AVM, and not the surrounding brain, in AVM disease? The study was limited to a set time period beginning January 1, 1997 and ending December 31, 1999. In most patients, additional treatment or control angiography were pending at the end of the study period. Therefore, the final outcome cannot be assessed. Nevertheless, TBS obviously has an impact on AVM treatment. 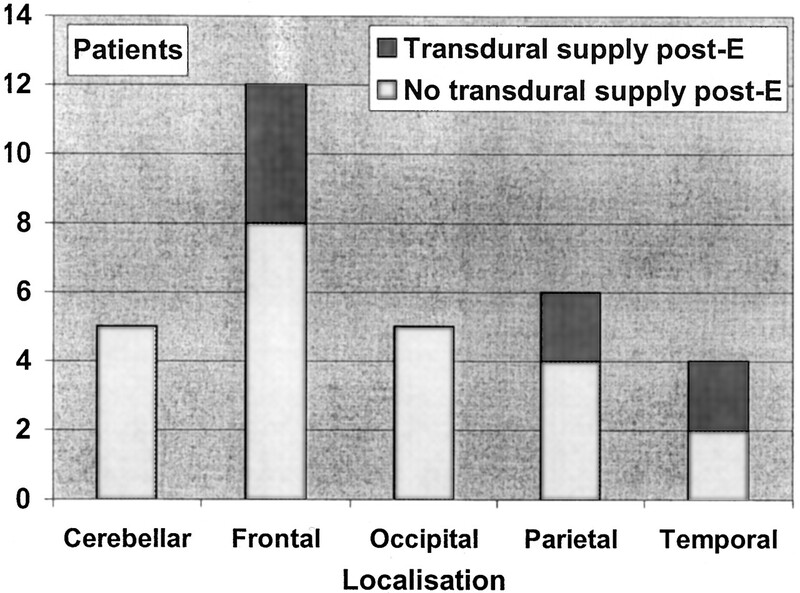 Neither embolization nor surgery is facilitated by the recruitment of dural vessels, and in fact, a TBS might make both treatments difficult or even impossible. In radiosurgery, the volume of the AVM is the parameter that most influences the outcome. The size and shape of the AVM nidus, regardless of the route of the blood supply, determines the volume to be irradiated. An increase in volume concomitantly increases the risk of a radiation-induced complication, all other factors being equal (25). Thus, incomplete angiograms may cause erroneous decisions and reduce the quality of care, regardless of treatment. The managing team may also be lulled into a false sense of security, believing that the morphologic results of the treatments are better than they actually are and thereby overestimating the morphologic effects of their efforts. We therefore recommend that the angiographic protocol in an AVM adjacent to the dura mater should include the injection of contrast material into the dural arteries, particularly after embolization, even if TBS was not evident in the previous examinations. A TBS is common in AVMs adjacent to the dura mater; the frequency increases with AVM volume and patient age. Intracranial hemorrhage does not seem to be a predisposing event. Transarterial embolization appears to induce factors that promote the development of a TBS to an AVM. Supported by a grant from Karolinska Institute, Stockholm, Sweden.